Troublemaking? Is There an App for That? While I wrote last spring about how much I love my iPad right after I got it, I really haven’t had a chance to play around with it that much. I don’t have that many apps for it. I also don’t have that many apps for my iPhone. Maybe that’s partly because the few times that I have actually gone to the app store, I have been overwhelmed by the number of (cr)apps that are available. Yet, I can’t stop thinking about how a troublemaking app, one that enabled you to practice the virtue of troublemaking (being curious, thinking critically, asking questions, disrupting common sense assumptions), might be fun and useful. I am still uncertain about the value of an app. Is is the best platform for what I want to do? Why is it better than just using a blog? Since I imagine my app to be connected to a larger vision of public pedagogy and making ideas/theories about troublemaking accessible to a wider range of folks, is an app, which usually (but doesn’t always) cost something, the best approach? Sigh…like a “good” academic, I need (and want, because I am a nerd too) to do some research on these questions. Hmmm…I wonder where I can find some critical essays about smartphone apps? Suggestions? 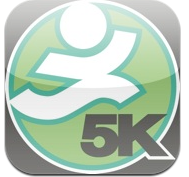 In early June, I started running with one of the many Couch to 5K apps: C25K. note: A few weeks after starting the program, I found a blog post about it on ProfHacker. Here’s how it works: You run with the program three times a week for 30 minutes–or, as I am doing it, every other day–and gradually build up strength and endurance as you alternate between walking and running. The program tells you when to run, walk and cool down. The simple format (which thankfully has few extra, pointless features) coupled with an underlying philosophy of the repeated and deliberate practice of gradually building up good habits, seems like a great model for an app. Repeated and habitual practice is key for my own thinking about cultivating virtuous troublemaking; you need to ask questions regularly and practice thinking critically, subversively, transformatively, creatively all of the time. I also like how it uses GPS to map your route so you can see (and share with others) your route and archive it for later. It also has a journal, so you can write about and archive the run (how it went, the weather, terrain). Finally, you can share your progress with others on facebook or twitter. I’m really interested in thinking through how to use new technologies, like smartphone apps, to develop and practice virtues. So I decided to check out what virtue apps already existed. 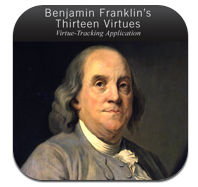 After searching for “virtue iPhone apps” on google, I found Ben’s Virtues. 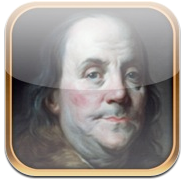 In this app, which is based on Benjamin Franklin’s chart of 13 virtues (temperance, silence, order, resolution, frugality, industry, sincerity, justice, moderation, cleanliness, tranquility, chastity, humility), you can chart your daily conduct. According to the “about” page on the app (unlike C25K, I have not tried this one out, although I did download it–it’s free), you review your conduct in relation to one of the 13 virtues at the end of the day (you do a week on each virtue). If you fail to practice that virtue–for example, industry (“Lose not time; be always employ’d in something useful; cut of all unnecessary actions”), you tap the day’s date to place a mark. This app is based on Franklin’s own chart for logging his virtuous behavior. It doesn’t offer any additional features, like posting your failure to follow a certain virtue on twitter or facebook. Wow…can you imagine if an app like this did have such a feature? Confessing your moral limits through social media? In case my tone isn’t clear, I find this idea to be extremely problematic, yet interesting from the perspective of how we develop our moral selfhood in relation to others. I haven’t spent that much time looking through this app (and I haven’t spent much time critically reading/reflecting on Franklin’s virtues–are they the basis of Franklin planner stores…ugh? ), but I find both the set of virtues (masculine, business-oriented) and the format of the chart/app to not be useful for my own project of troublemaking (a practice of daily reflection = marking digressions on a chart doesn’t fit with my own undisciplined approach). Additionally, the app doesn’t give you much guidance on what Franklin’s virtues actually mean (they do suggest buying Franklin’s autobiography at Powell’s books) or how we are supposed to interpret what is or isn’t an unnecessary act (see definition of industrious above). It makes me wonder about what other ways people can think about using apps to promote and cultivate virtuous practices? Instead of having a chart to mark, what other features could an app offer that would allow you to critically reflect on your day and how virtuous behaviors work in relation to a broader ethos (like social justice or feminist models)? After doing a little more research on the interwebz, I found some other bloggers writing about Franklin’s chart and his virtues, like Merlin Mann’s 43 Folders (a STA/room34 favorite) and their post, Ben Franklin: Keeper of his own ‘Permanent Record’, and the Art of Manliness and their 13 week series on Being Virtuous the Ben Franklin way. I also found another app, Virtues, by Equilibrium Enterprises. While Ben’s Virtues was free, this app costs 99 cents. It is based on the same chart and the same description of virtues, but it has many added features, including a much lengthier description of how to use to app and what to to with the chart. It also allows you to develop your own rating system (out of a scale of 5.0, pick your “target” number for a certain virtue) and your own custom virtues (should I add troublemaking, perhaps?). When you rate yourself, you are required to type up a few comments about your rating, your day, etc. I like that you can customize the app with your own virtues and that daily critical reflection = evaluating yourself with a number rating + typing up some thoughts (as opposed to the Ben’s Virtues’ approach of only marking your failures in a chart). However, I don’t like using a numerical ranking system (how do you evaluate a day’s virtuous behavior on a scale of 1 to 5?). Even though I’m not sold on this app, I might just have to try it with a customized troublemaking virtue. Well, I’m not even close to being done of my research/reflection on what a troublemaking app could/should look like, but I need to end this blog entry now. For next time, I want to spend some time discussing feminist troublemaking apps by starting with bitchmedia’s Revenge of the Feminerd: There’s an App for That and the app, Hollaback!